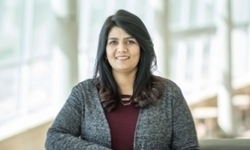 UNMC › Pathology and Microbiology › Faculty › Bios › Hina Naushad Qureishi, M.D. American Society of Clinical Pathologists. Hu Q, Naushad H, Xie Q, Al-Hawaidi I, Fu K: Needle-core biopsy in the pathologic diagnosis of malignant lymphoma: a retrospective study of 105 consecutive cases for the diagnostic accuracy, sensitivity and specificity. Archives of Pathology and Laboratory Medicine, Submitted April 8, 2012. Naushad H: White blood cells. Medscape Reference Epublication, January 2012. Naushad H, Choi WW, Page CJ, Sanger WG, Weisenburger DD, Aoun P. Mantle cell lymphoma with flow cytometric evidence of clonal plasmacytic differentiation: a case report. Cytometry B Clin Cytom 2009; May, 76(3):218-224. H Naushad, P Sharma: Multiple myeloma. Cornhusker Family Physician – Focus on the Immune System. Summer Issue 2008; 53(4):61-63. Natkunam Y, Hsi ED, Naushad H, Aoun P, Zhao S, Elson P, Pohlman B, Bast M, Levy R, Lossos IS: Expression of the human germinal center associated lymphoma (HGAL) protein identifies a subset of classical Hodgkin lymphoma of germinal center derivation and improved survival. Blood 2007; Jan 1, 109(1): 298-305.